TUCSON, Ariz. – It was a packed room at Udall Park Regional Center as kids and their parents took part in Design Day. City of Tucson’s Parks and Recreation Department won a grant from KaBOOM! a non-profit focused on giving kids a fun and safe place to play. The old playground wasn’t a safe place for children. Parents expressed concerns about exposed metal and missing playground parts. The only place kids could play was the swings and the slide. Now, the kids have bigs dreams – they want slides, swings, monkey bars and a zipline! UnitedHealthcare is funding the playground $100,000 but parents still need to raise their part $8,500. To help give these kids their dream playground click here and make sure to choose the KaBOOM! Udall Park donation type. The playground build day is set for May 23, 2018. 100-125 volunteers are needed – click here to apply! TUCSON, Ariz. – A new playground might be coming to Udall Park after the Parks and Recreation Department won a grant from KaBOOM!, a non-profit focused on giving kids a fun and safe place to play. Mother of three, Stephanie Balazs reached out to the City of Tucson last year about the playground at Udall that her children often use. Platforms leading to the slide which has exposed metal were also very dangerous. “The height between the platforms are so great that if a kid were to step on the bar and slide off, they would fall in between the two platforms to the sand,” says Balazs. KaBOOM! reached out to the City of Tucson in January and told them that there was interest in a playground build in Tucson. The department chose Udall Park’s playground after concerns from parents about the park needing to be updated. The playground will be ready for kids by summer 2018, but first, they need the kids help in planning their perfect playground. “The design day for kids will give them the opportunity to draw what their ideal playground looks like,” said Balazs. They are looking for 30 kids to RSVP for a design day meeting on March 29, 2018. If you would like to be part of the process, email Sierra Boyer at sierra.boyer@tucsonaz.gov. Mountain biking is an increasingly popular sport in Tucson because of our favorable weather and access to desert trail systems. 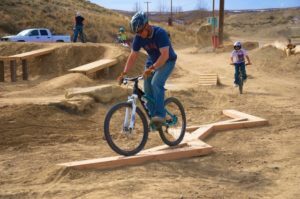 There has been a growing demand for a centrally located park that provides both trails and challenging features for users of all ages and skill levels. The sport faces a couple of obstacles: our existing, natural desert trails are a difficult place to learn and access to these trails is on the outskirts of town. 100 Acre Wood is a proposed mountain bike progressive skills park with trails and features geared toward everyone, from the beginner to the advanced rider looking to hone their skills. The park is centrally located near the entrance to Davis Monthan Air Force Base. The (+/-) 100 acre site used to be part of the base, but the construction of Golf Links Road isolated the site. 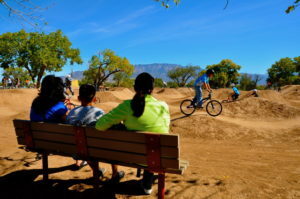 A lease agreement between the United States Air Force and the City of Tucson allows the City to develop, operate, and maintain the proposed community bicycle park. 100 Acre Wood will allow the mountain biking community to grow by offering new riders a place to build their skills. This off-road facility will provide a safe environment for beginners as well as advanced trails for riders looking to challenge themselves. The park will also compliment Tucson’s Gold Level Bicycle Friendly Community status. Mayor Jonathan Rothschild has been working with Evan Pilling, Executive Director of the Sonoran Desert Mountain Bicyclists, Davis Monthan Air Force Base, the City’s Parks and Recreation Department, Hilride, and McGann & Associates Landscape Architects to develop a master plan for the park. The City has been providing staff support towards the park’s planning and development. Your financial support is essential for making the 100 Acre Wood mountain bike skills park a reality. We sincerely appreciate your donation. Donate now. If you would like to volunteer to help build trails, please sign up on the Sonoran Desert Mountain Bicyclists website. To make a donation, please visit our donations page and choose “100 Acre Wood” from the dropdown menu. The City of Tucson Parks and Recreation department will be hosting the annual summer track and field and road races throughout June and July. Track and field is every Tuesday, June 7 – July 19, at Catalina High School, 3645 E. Pima St. Registration begins at 5:45 p.m. and the meet begins promptly at 6:30 p.m. Events will include: long jump, turbo javelin (18 and under), shot put, high jump, 50 meter dash (5 and under), 100, 200 and 400 meter dash, 800, 1600, 3200 meter runs, 4 x 100 relay, and 4 x 400 relay. Road races are every Thursday, June 9 – July 21, at Reid, Freedom, and Kennedy parks. Locations will rotate each week in that order, beginning and ending at Reid Park. Registration begins at 5:45 p.m., with races starting at 6:30 p.m. Events will include: 1 mile predict, 2K, and 5K race. The costs for these events are $3 for youth 17 and under and $4 for adults. Ribbons will be given to the top finishers at each track and field meet and road race. More information can be found on the City of Tucson Parks and Recreation sports webpage or call the Sports Unit at 520-791-4870.